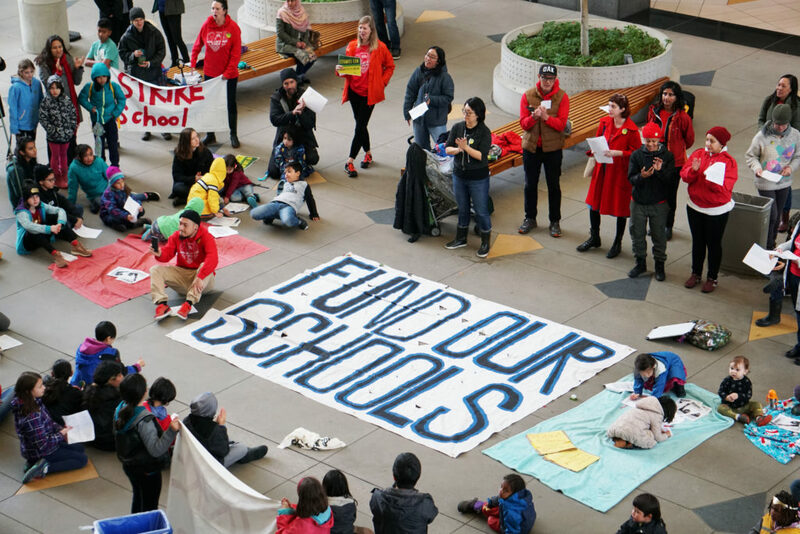 Parents and students at a "solidarity school" protest in downtown Oakland on Feb. 27, 2019 during the Oakland teacher's strike. It is the first concrete proposal to surface in the Legislature since the teachers’ strikes in Oakland and Los Angeles early this year highlighted the fact that California spends less per student on its public schools than most states. Multiple teacher and other organizations have called on the Legislature to somehow come up with more funds to help struggling school districts. 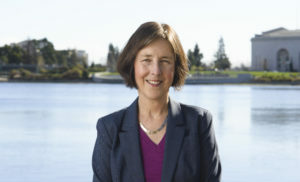 One of the issues is whether any additional funds would be raised by the Legislature imposing them, or whether voters should be asked to approve them at the ballot box, along the lines of an initiative that has already qualified for the November 2020 ballot that would raise taxes on commercial properties. Either the legislative or the initiative route would encounter formidable odds for passage. The bill would increase the tax rate for corporations with incomes of more than $10 million from the current rate of 8.84 percent, to anywhere from 10.84 percent to 14.84 percent. Financial institutions with similar high income levels will be subject to an even higher tax — from 12.84 percent to 16.84 percent. Skinner and other backers, which includes Assemblywoman Buffy Wicks, D-Berkeley and Assemblyman Rob Bonta, D-Alameda, say the bill would raise up to $5 billion a year. The funds would be largely spent on “expansion or improvements to early childhood programs and other educational programs,” according to an analysis by the Legislative Counsel. Skinner said the tax increases she is proposing represent a “tiny percentage” of the tax savings corporations have received as a result of the tax cuts promoted by President Donald Trump and approved by Congress in 2017. Her bill would only cover .2 percent of businesses in California and leave small businesses untouched, she said. “It’s certainly a fair tax bill that could potentially reduce inequality and raise money for the schools,” said Lucy Dadayan, a senior research associate at the Urban Institute-Brookings Tax Policy Center, a nonpartisan think tank based in Washington D.C. However, she cautioned that the measure could also “have some negative unintended consequences” by encouraging some companies to leave the state. Skinner introduced a similar bill last year, but it failed to gain any traction in the Legislature. The question now is whether the political climate has shifted sufficiently to improve its chances this year. Other efforts to pass what are called corporate tax “pay ratio” bills in California have similarly faltered in the past. In 2014, a pay ratio bill introduced by then-state Sen. Loni Hancock, Skinner’s predecessor in the district, and then-Sen. Mark DeSaulnier, D-Concord won a one-vote majority in the state Senate, but fell far short of the required two-thirds vote. Pay ratio bills have been considered in a number of states, including Connecticut, Illinois, Massachusetts, Maine, Rhode Island and Washington state, but none have become law. The only place a pay ratio bill has been approved is in Portland, Oregon. There the city imposes a surtax on the business license tax on every publicly traded company where the CEO’s compensation is more than 100 times the median worker’s pay. “Income inequality has gotten out of hand, putting the California dream out of reach of too many Californians,” said Conway Collis, president of GRACE, an advocacy organization dedicated to reducing child poverty. The tax will “help our struggling schools and help end child poverty,” said Collis, a former chairman of the State Board of Equalization, which oversees tax collection and administration. It’s likely that in the months ahead other proposals will emerge from the Legislature to generate more funds for the state’s public schools serving over 6 million children. Skinner noted corporate profits are at an all-time high and that the portion of tax revenue California receives from corporations is at its lowest point in 40 years. All of these are arguments that should generate support for her bill, she said. To find corporate pay ratios in California, see this database assembled by the AFL-CIO based on Securities and Exchange Commission filings.